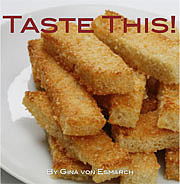 Published on March 6, 2016 in Recipes. 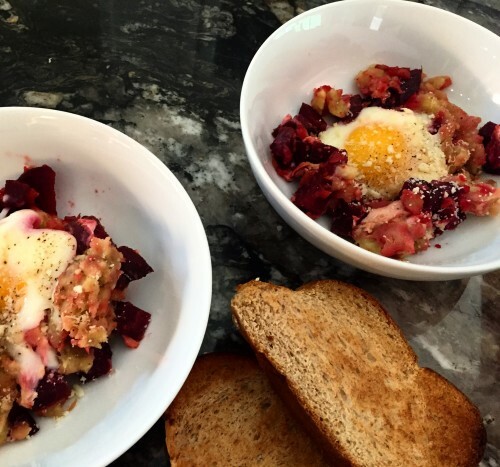 0 Comments Tags: beets, brunch, eggs, hash, vegetarian. I’ve done all sorts of soul searching these past few months. An illness will inevitably do that to you. And just when you think you are done, maxed out, finito, fed-up, at your limit >insert any other expression that implies you are DONE< and in that mental space where you think that you can’t possibly take on any more, that SOMETHING changes and you miraculously just find your way. It’s what you do when you are faced with your own humanity. You ponder, you experience anger and then you exhibit the full gamut of other emotions. But through it all, at least in my case, with the love and support of family and friends, things start to take shape. I can tell you that finding your path amidst one’s quest to overcome adversity is not always riveting or even profound. It can be the subtlest of situations –and well, subtle can be quite revealing too in both life and in food! Aside from my newly processed self revelations, I am in the midst of a dietary food revolution as I look to move towards a more Mediterranean diet. In all honestly, I do not feel that I am fighting a daily food revolution, some days it truly feels like I am in the midst of recipe gentrification. My diet, while often considered to be healthy by most, is getting a good scrubbing- removing most of the meats and refined sugars. It’s occasionally daunting and exhilarating all at the same time. While we haven’t yet found our stride as a family on one dinner front, we can usually agree on breakfast, brunch and desserts! 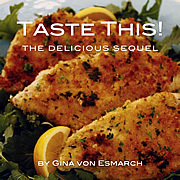 Today’s recipe is another mash-up >pun intended< of some of my favorites colors and flavors. 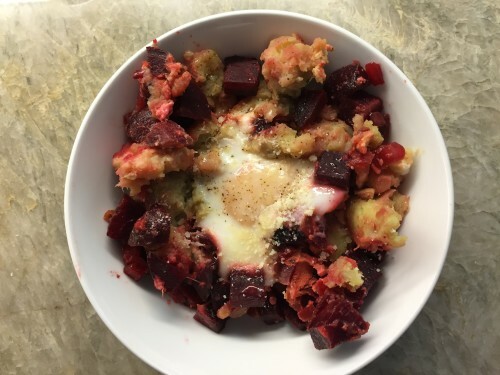 Gorgeous red, fresh cooked and prepared beets are combined with a subtle sweet potato mash and topped with a crispy fried egg with just a dab of soft yolk. 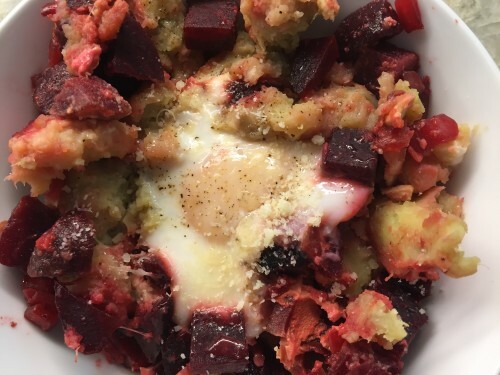 The beet flavor creates a sweet tang with two hardy staples to balance it out, potato and egg. Eating well shouldn’t be complicated but it should be delicious and affordable. I think this recipe checks off all of those boxes. And the name is simply too cute! In a high-sided skillet, heat oil over medium-high heat. 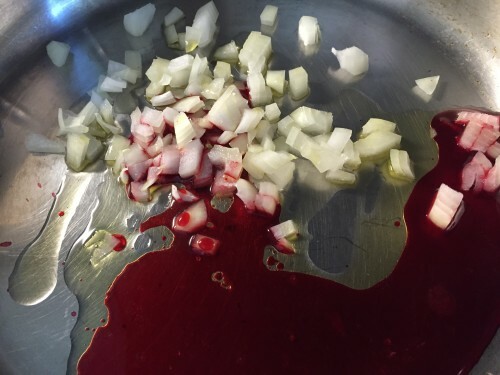 Add onion and any beet juice; cook until onions are softened. Next add in diced beets and cook approximately 4 minutes, stirring regularly. 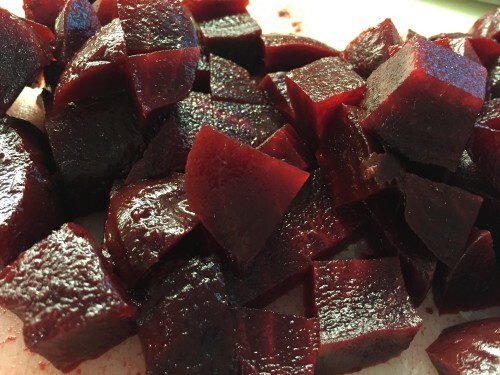 Reduce heat to medium, and combine mashed potatoes, salt and pepper into the beet mixture and continue to cook stirring regularly. 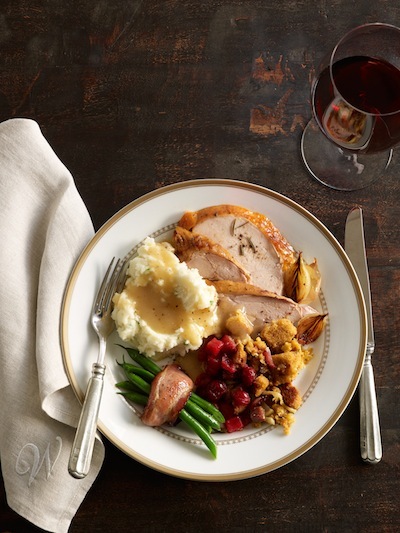 If mashed potatoes are sticking to the bottom of the pan, add in a tablespoon or two of water. Stir in parsley. Make four wide wells in the hash. Crack one egg into each and season egg with salt and pepper. Cook until whites set but yolks are still runny; approximately 5 -6 minutes. Cover with a lid for slightly quicker cooking time. Finish off with a sprinkle of Parmesan cheese. 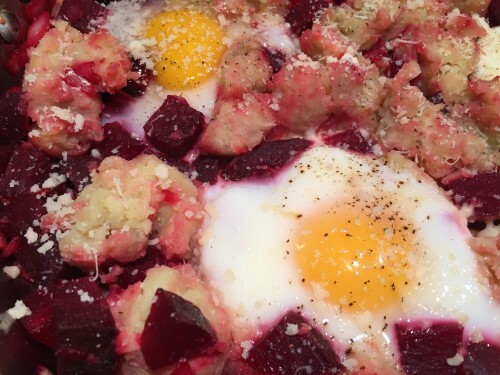 Note: If your beets and potato are not cooked, wash and skin them and then place in a high-sided skillet. Cover vegetables with water and bring to a boil. Add scant amount of salt and cook until tender; approximately 7 minutes. Drain and set aside until slightly cooled. 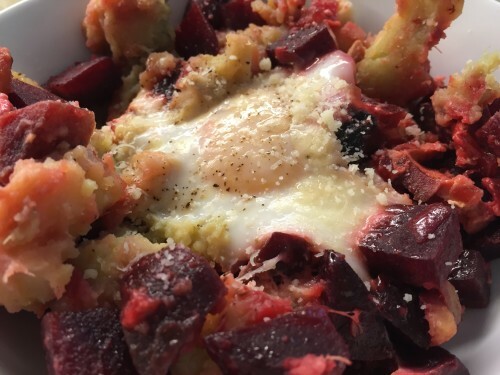 Dice beets and mash sweet potatoes. Follow above recipe.